We’ll admit it: selling Enterprise software on display can be tricky. It’s such a difficult task simply because common strategies that work in markets like weight loss, finance, and ecommerce will often not get you the results that you’re looking for. A high-priced product on display can be tough to sell. However, there is a way to do it. 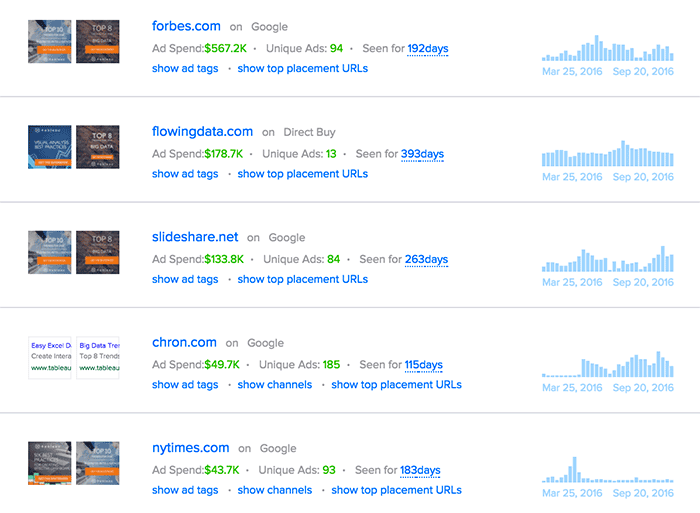 Many large SaaS web apps are even amazing results with Display advertising. In today’s post, we’ll reveal the display strategies behind five of 2016’s most talked-about SaaS apps, including the data analysis giant Tableau and the classic Adobe. There’s some really cool stuff going on in the SaaS space on display. So if you’re tired of trying to emulate the strategies of the “one weird trick to shed belly fat” companies, then this blog post is for you. Tableau is a Seattle-based software company that sells data visualization and analysis software. Tableau has spent an estimated $5,061,632 on display (desktop spend only) over the past six months. 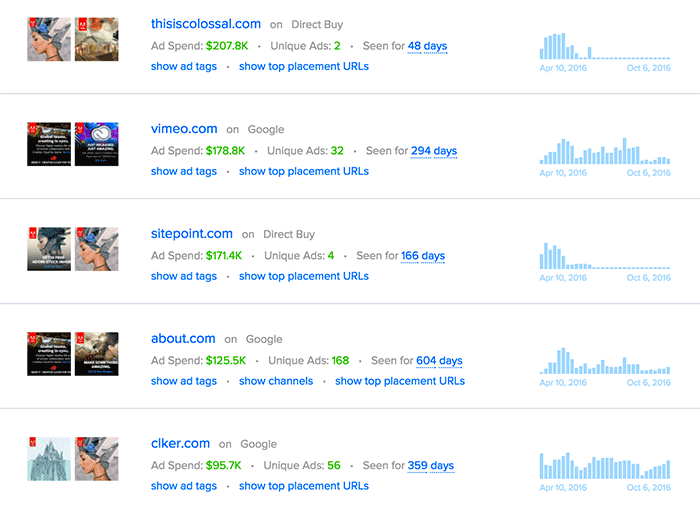 The ad network strategies for most of the advertisers in this post are fairly similar. Most choose the Google Display Network and Direct Buys as their primary traffic sources. Tableau is no exception. As I mentioned before, finding enterprise level customers on display can be tricky for some advertisers. Publisher selection is one of the main difficulties. Enterprise level software customer publishers must be very specific. They have to have a very sophisticated target audience with the money to purchase the product. This is why so many B2B SaaS companies run Direct Buys. You’ll see below that Tableau’s publishers cater to a business audience (with the exception of news sites like Chron.com and Nytimes.com). The most interesting publisher on the list is Flowingdata.com. Flowing Data offers step-by-step courses and tutorials on data visualization. The content is designed for data scientists and researchers. In other words, its courses go beyond what we learned in high school statistics. Flowing Data’s audience is REALLY into data. This is the perfect selection for a company that sells data visualization and analysis software. Find sites where the “nerds” of your industry hang out. 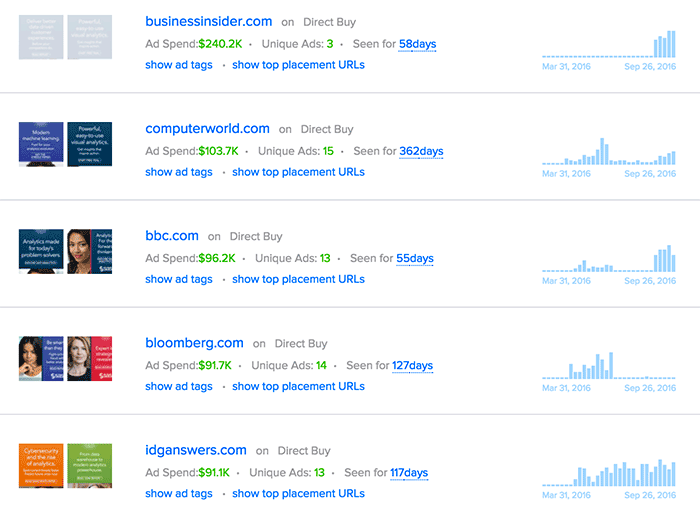 You may not be able to access their ad inventory through a network or exchange, but many sites are open to direct buys, especially if other advertisers in your same vertical are already buying directly on that publisher. 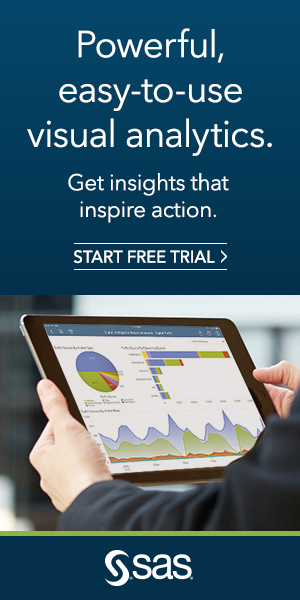 As you’ll see in the ad creatives section, Tableau rarely tries to directly sell the software itself. Instead, it chooses to give away cool white papers and eBooks about data trends and the best practices. An enterprise software company has a longer sales cycle than most other businesses. Purchasing enterprise software is a big deal. The prospect will likely need to get permission from superiors, sign a contract, and probably spend a lot of money relative to other purchases. 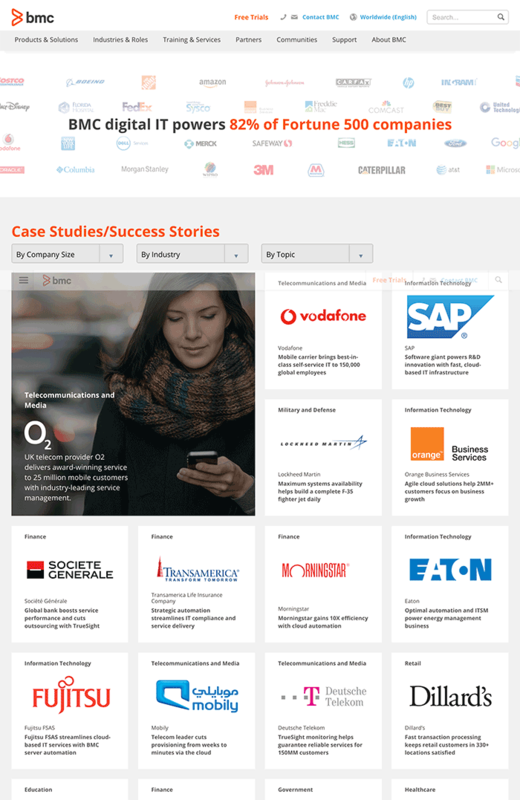 While opt-ins may not be the choice for most B2C companies, we’re still seeing a lot of the big B2B and enterprise software companies using them on display. The good news is that it’s fairly easy to test multiple lead magnets (at least from a development standpoint). 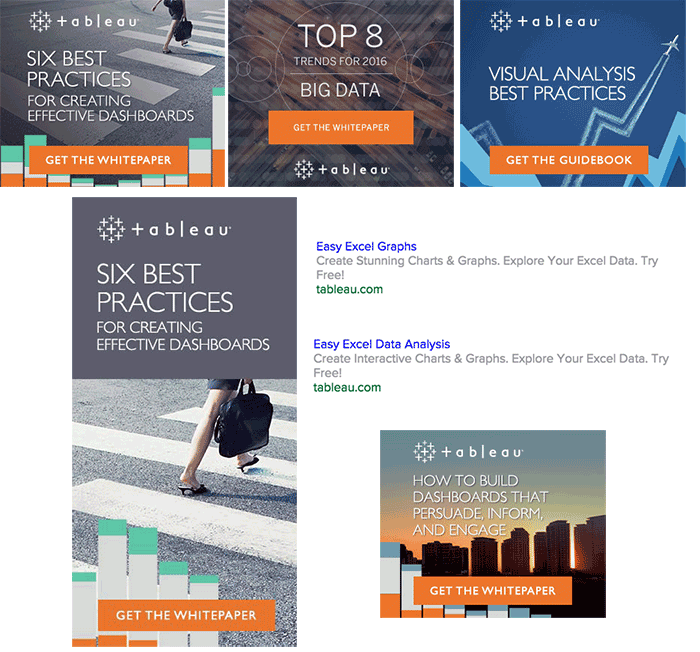 In the next section, you’ll see how Tableau conquers this challenge by using landing page templates. 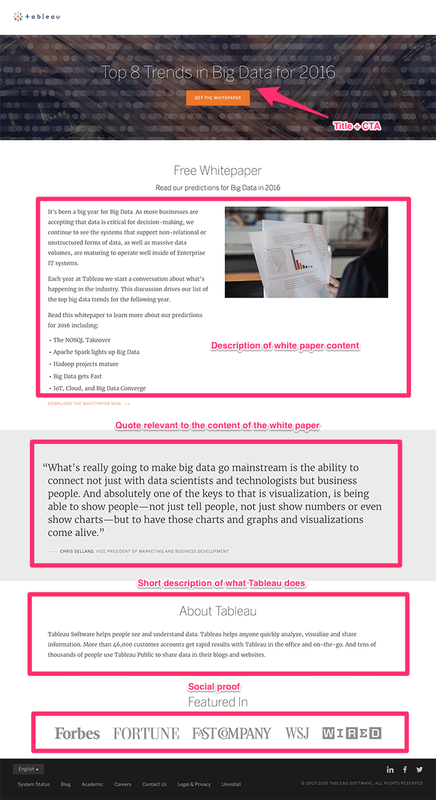 Given the amount that Tableau spends on these pages, it’s quite likely that this template works. 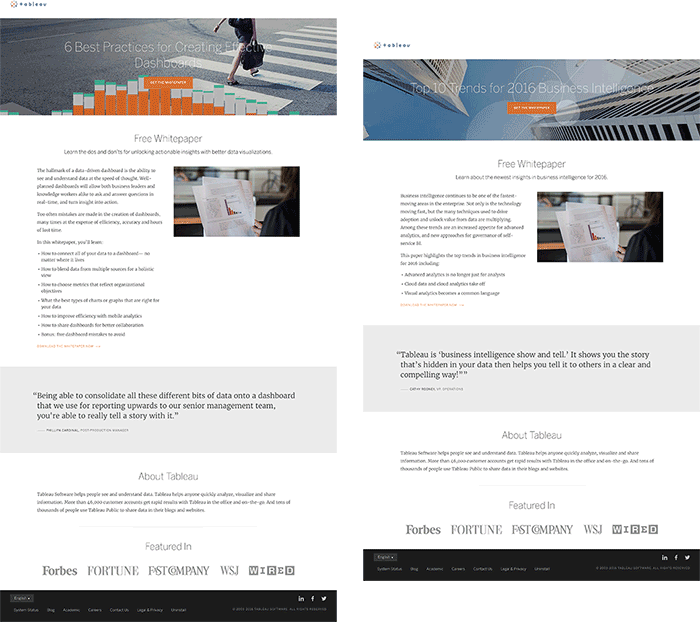 Here are two other landing pages that follow this exact same layout and formula. Again, this is great news for companies that test a lot of different opt-in offers. It means that they only have to create one basic template and then replace each section with text that is relevant to the whitepaper or eBook. Here we have a BIG spender on Direct Buys. SaS has spent an estimated $1,363,200 on desktop display ads over the past six months. The largest chunk of its spending has been allocated to Direct Buys. This comes as little surprise given that it’s an enterprise software company that sells big ticket items. 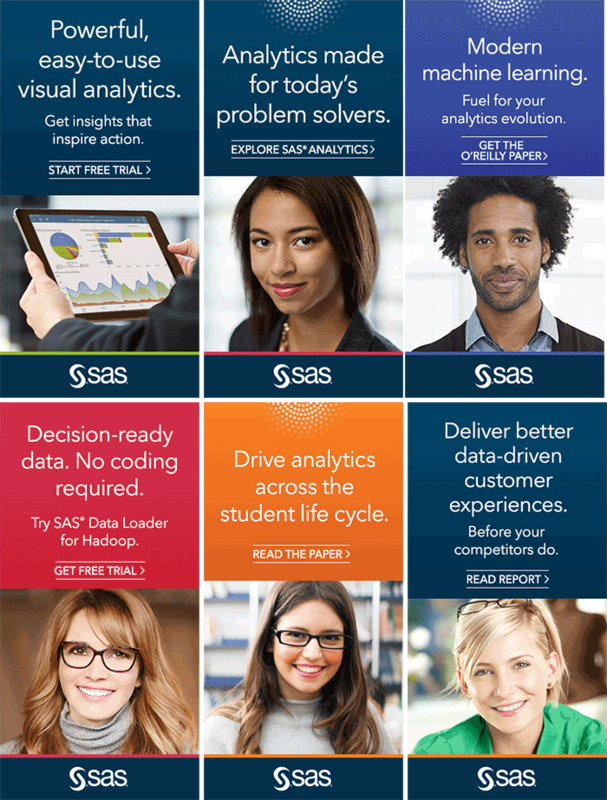 SaS uses very professionally styled ad creatives that test out pictures of people of both genders and multiple races. 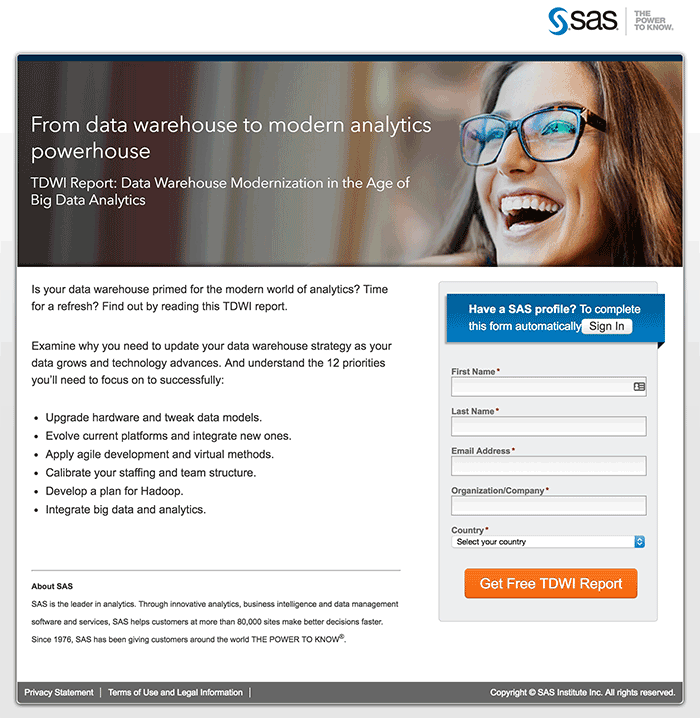 SaS is also testing out more free trial creatives in addition to whitepapers. Which ad creative has it spent the most on? It’s actually the ad creatives that doesn’t include a photo of a person at all. Despite all of its A/B testing, the ad that wins doesn’t have to do with a human connection to a certain type of person, but rather a cool picture of a tablet with interesting graphs on it. 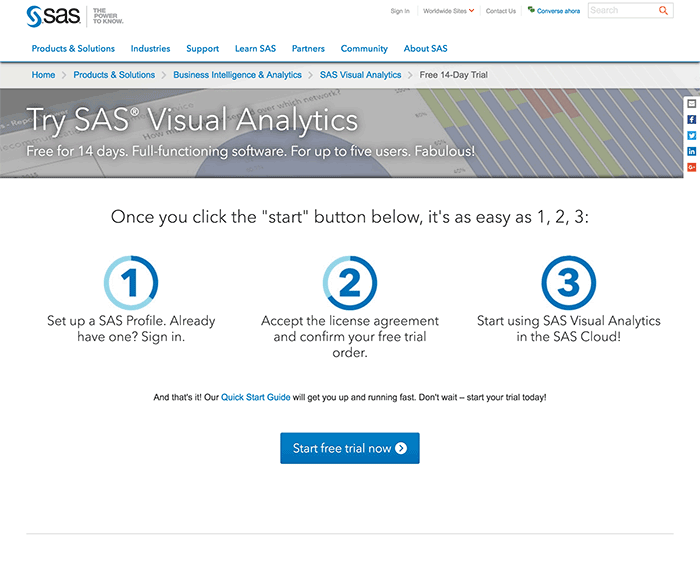 SaS is A/B testing three different types of landing pages. 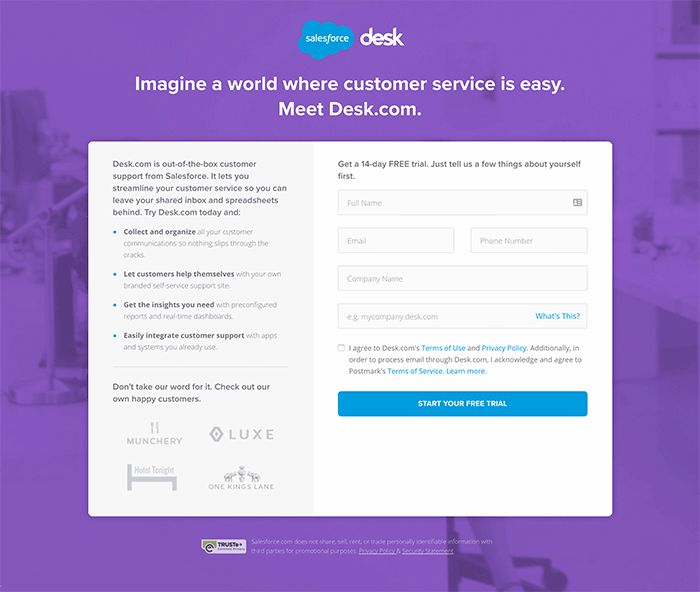 Desk is Salesforce’s offering to the online help desk space. 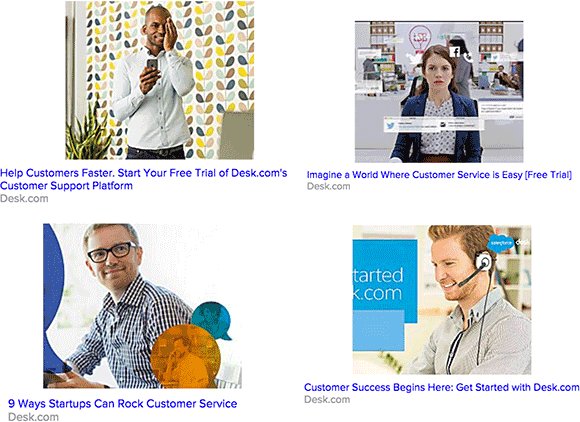 It has spent an estimated $959,104 on desktop display for the Desk.com domain over the past six months. Salesforce is one of the few enterprise software companies that runs traffic on native networks like Taboola and Outbrain. However, it allocates most of its ad spend to direct buys. 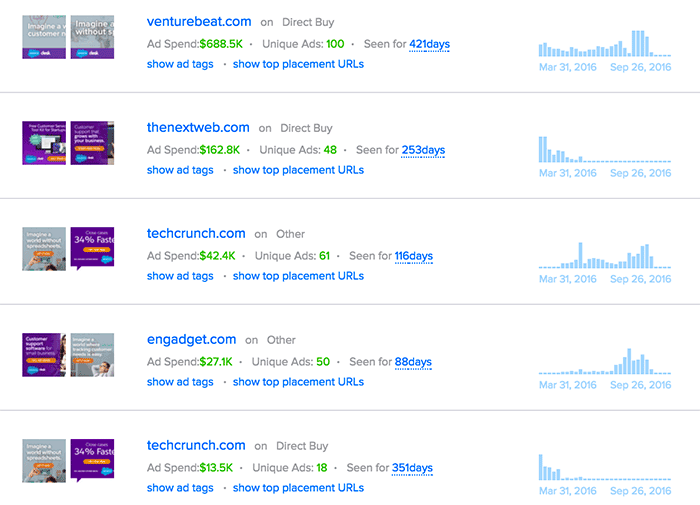 Salesforce is running big direct buys on the major tech news sites. They buy directly from the big three: Venturebeat.com, Thenextweb.com, and Techcrunch.com. We’ve seen that all of the companies featured in this post mostly use ad creative and landing page templates. Salesforce follows the same pattern. All of the headlines also follow a template. They all start with the word “imagine” and then offer a big benefit for those in customer service (e.g. no more spreadsheets, more time, better tracking, etc.). Salesforce has spent much less on native, but it’s still worth taking note of its strategy. Desk.com is split testing two different pages. The first page is a trial sign-up page. It’s pretty sparse. There’s not much explanation of what the product does and it seems as if it’s using the Salesforce brand name to get people into free trials. The second Desk.com page being split tested against the one above is a longer form page. This page does include information and videos on what the product does. Again, the goal of the page is to lure the prospect into a free trial. 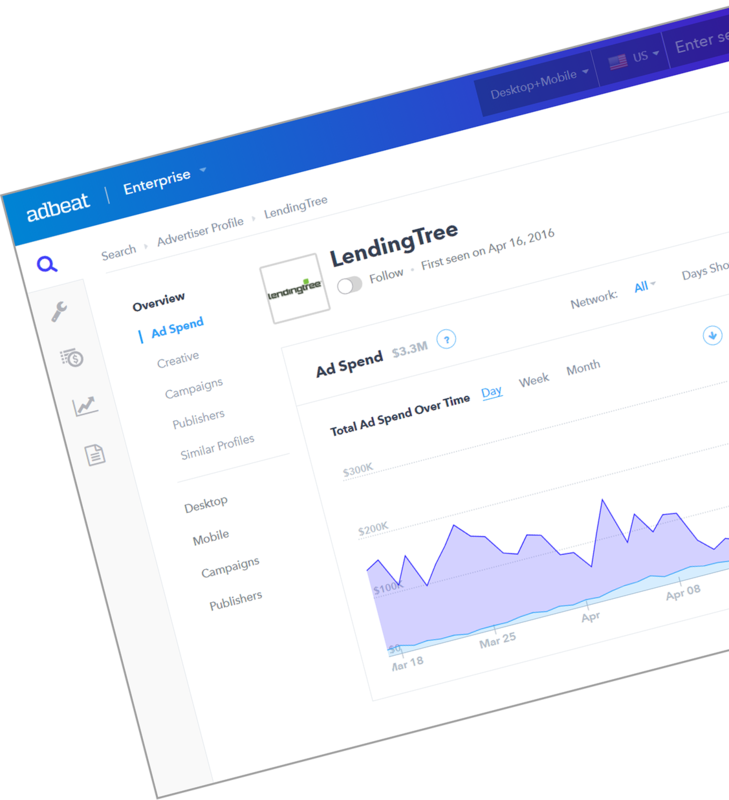 If we take a look in Adbeat, we see that Salesforce has spent the majority of its ad spending sending traffic to page #2, the long-form page. We can assume that this page works better, which is not too surprising given the trial sign-up page has almost no information. 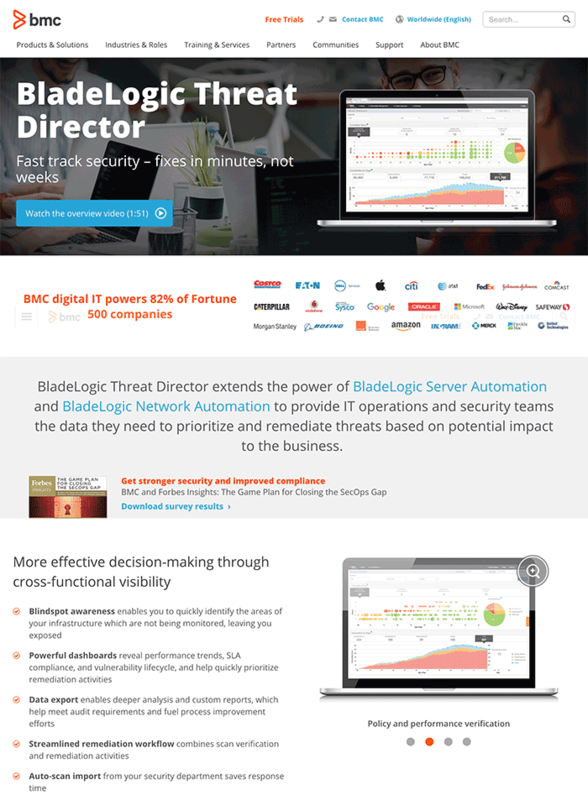 BMC is an enterprise software company that sells various pieces of software to large businesses, such as cloud management tools, mainframe management systems, security, and many more. It is a billion dollar company with over 6,500 employees. BMC also claims that 82% of fortune 500 companies use its software, as you’ll see in the ads below. BMC has spent an estimated $530,816 on desktop display over the previous six months. BMC also uses the same template and size for most of their ad creatives. The only differences are the image and the headline, with each separate ad creative taking them prospect to a different landing page. Some big companies get lazy and send all traffic to one or two generic landing pages. Not BMC. 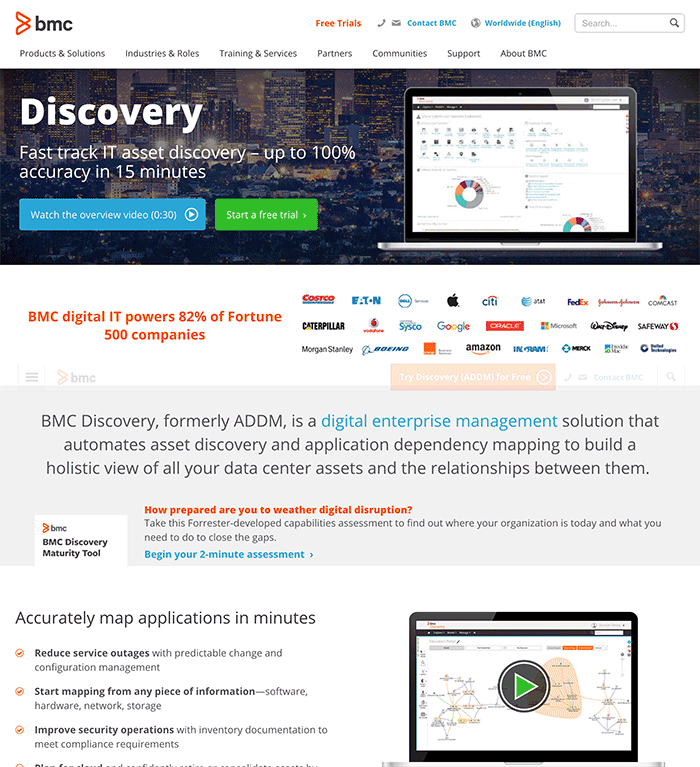 BMC has a dedicated landing page for each product it advertises on display. As you’ll see below, all of these pages are long-form, detailed, and quite cleanly designed. 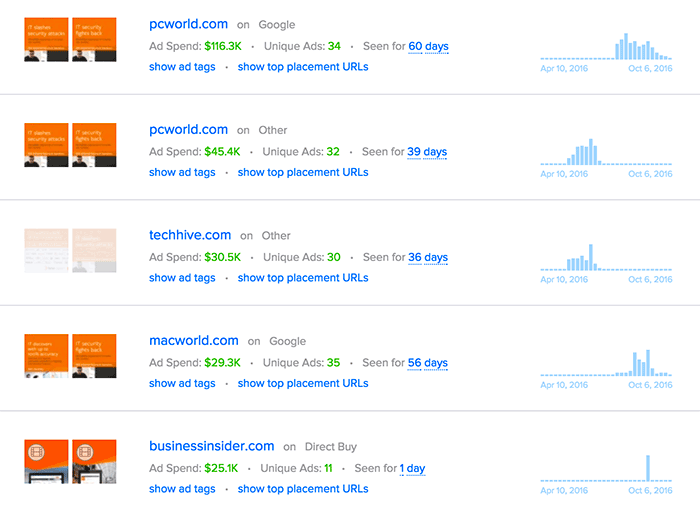 All in all, BMC is doing a much better job than most software companies at testing different landing pages and ad creatives. It also goes an extra step by making the landing pages long-form. The extra details can often help with conversions (as you’ve seen above), but, obviously, it’s good to test long vs. short. Adobe has spent an estimated $9,703,424 on desktop display over the past six months. I would not recommend the strategy of sending users to a pricing page (perhaps off of a retargeting ad, but even then…) for most companies. As we’ve seen before, many of the other Enterprise software companies A/B test very different landing pages that are often either free trials or long-form. 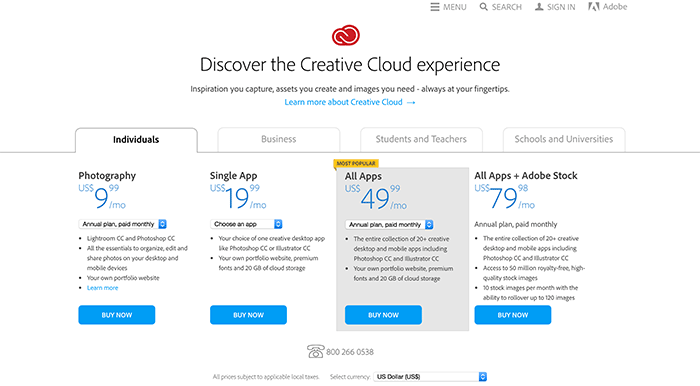 Adobe can probably get away with this due to their brand name (everyone knows what Photoshop is) and a large, branding-style marketing budget. Selling Enterprise products through display is not as straightforward as selling B2C products. 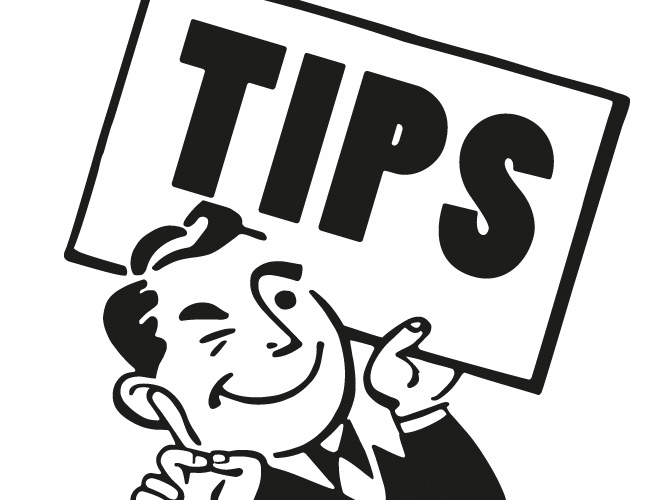 However, it can be done and it can be very effective for garnering new leads. The key is in your landing page targeting and offers. If you can put compelling whitepaper offers in front of the right audience, there’s no doubt that your efforts on display will pay off.